“I write these things to you who believe in the name of the Son of God so that you may know that you have eternal life.” (1 John 5:13). The Apostle John uses the word “know” almost 40 times in this short letter. Why? because the Lord wants us to know him and know that we know him. That we know our sins are forgiven. That we know we have been adopted into his family. That we know we have eternal life. That we know we will be with God for ever and ever. So how can we know? Let’s consider three tests. Three simple tests so that you can know you know. “Everyone who believes that Jesus is the Christ is born of God.” (1 John 5:1a). So do you believe the evidence? Did the evidence compel you to put your trust and confidence in Jesus? Have you received Jesus into your life? If we really believe in Jesus we will respond to Jesus call and receive his promise to come into our lives. It is important to remember though that this is a work of God – we are saved by his grace and not our faith or works. That is why John writes, “Everyone who believes that Jesus is the Christ is born of God.” (1 John 5:1). That is the first test. The Lordship test. Is Jesus your Lord and Saviour? Yes or no? The second test? John spoke about this in more detail in chapter 4. You see, when we trust in Christ, we are born again. But we are born again into a family. God’s family. If the Lordship test is invisible, the family test is visible. When you wake up on Sundays who do you most want to be with most? Do you see Christ Church as your spiritual family? Do you love your brothers and sisters in Christ? Do you want to hang out with them? Are you protective of them? Are you praying for them? Is being part of a church family important to you? Yes or no? You see these tests are really very simple. 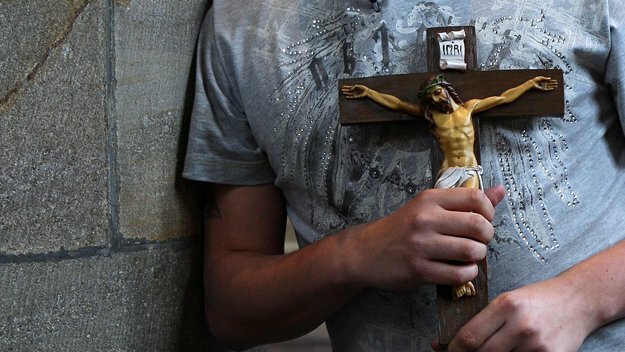 The Lordship Test: Is Jesus your Lord and Saviour? The Family Test: Do you identify with a church family? Do people see the family likeness in us? Do they look and say “you’ve got your fathers eyes!” It is not about a new ‘me’ but a new motivation. Do I want to please my father or myself? It’s not about attaining perfection but making progress. Instead of being of the world, we have overcome the world. In the world but no longer shaped and controlled by its values. Paul described his attitude. Can you identify with him? Is that your motivation? Is this your heartbeat? Are you becoming more like Jesus every day? Then you pass the third test. The Family Test: Do you love your church family? The Paternity Test: Does the family likeness appear in me? John concludes this passage with this bold and categorical statement about the basis of assurance. Seven questions for you (and I’ll give you the answers). 2: If you have Jesus Christ in your life, what else do you have? Answer: Eternal Life. 3: Can a person know that they have eternal life? Answer: Yes. 4: On what basis? Answer: On the basis of the authority of God’s word. 5: Do you know that you have eternal life? Answer? 7: Do you have the assurance of salvation? Our assurance of salvation is based on the authority, on the truth and the trustworthiness of God’s word not our feelings. God cannot lie. God has spoken the truth. Our assurance is therefore ultimately on the basis of what God has spoken about us. “To help us realise more adequately who and what, as children of God, we are, and are called to be, here again are some questions by which we would do well to examine ourselves again and again. Do I understand my adoption? Do I value it? Do I daily remind myself of my privilege as a child of God? Have I sought full assurance of my adoption? Do I dwell on the love of God for me? Do I treat God as my Father in heaven, loving, honouring and obeying Him, seeking and welcoming His fellowship, and trying in everything to please Him? Do I think of Jesus Christ, my Saviour and my Lord, as my brother too, bearing to me not only a divine authority but also a divine-human sympathy? Do I think daily how close He is to me, how completely He understands me, and how much, as my kinsman redeemer, He cares for me? Have I learnt to hate the things that displease my Father? Am I sensitive to the evil things to which He is sensitive? Do I make a point of avoiding them, lest I grieve Him? Do I look forward daily to that great family occasion when the children of God will finally gather in heaven before the throne of God, their Father, and of the Lamb their brother and their Lord? Have I felt the thrill of this hope? Do I love my Christian brothers & sisters with whom I live day by day, in a way that I shall not be ashamed of when in heaven I think back over it? Am I proud of my Father, and of His family, to which by His grace I belong? Does the family likeness appear in me? Do I, as a Christian, understand myself? Do I know my own real identity? My own real destiny? I am a child of God. God is my Father; heaven is my home; every day is one day nearer. My Saviour is my brother; every Christian is my brother too. We have asked the question tonight, “How to be sure I am a Christian?” I hope you know the answer. Lets pray. Let’s say ‘thank you’ for the privilege of knowing God and being adopted into his family. “Thank you heavenly Father my creator and sustainer, for making me your child and for adopting me into your family. Thank you Lord Jesus Christ for dying on the cross in my place to take away my sins and give me eternal life. Thank you Holy Spirit for the assurance you will never leave me and will help me grow to become more like Jesus every day. Amen”. This entry was posted in Bible, Sermons, Theology on July 17, 2013 by Stephen Sizer.